If there is one gun that absolutely no gun collection of any kind is complete without, it’s the .22 LR. Every gun collection needs to have at least one .22 firearm in it, be it a handgun or a revolver, without question. There are a great multitude of .22 firearms available to buy, and along with that, there are also a great variety of ammunition as well. 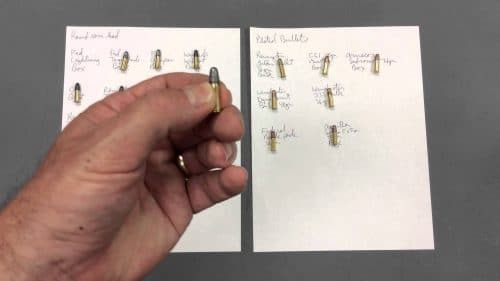 In the upcoming sections, we’ll cover the advantages of the .22 LR in general, the bullet types and weights of the .22, and then the best manufacturers of .22 LR ammunition that you can buy. There are so many reasons to own a .22 LR firearm that an entire book could be written on the subject. That being said, many people still underestimate the .22 and its capabilities. Too often, the .22 is relegated to being a plinking weapon for casual target shooting and not much else. 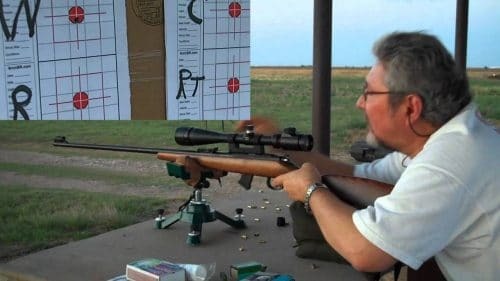 In reality, the .22 can be used for far more than that, for everything from target shooting to tactical training to small game hunting to homesteading to to survival to pest control to teaching new shooters how to shoot. The .22 LR has minimal recoil and low noise, which makes it an excellent training round without disturbing your neighbors. No, you can’t go shooting if you live in a suburban neighborhood, but if you live on a homestead with neighbors in relatively moderate to close proximity they likely would not be bothered by you firing .22s into a mound of dirt versus if you were to fire larger calibers. And as a survival or an SHTF round, the .22 LR is arguably one of the best calibers that you could have. True, it’s not the greatest round for self-defense (even though it could be used for that purpose). But on the other hand, the fact that .22 ammunition is so small and light means you can carry literally thousands of rounds of it on your person. That’s something you can’t do with 9mm or 5.56x45mm NATO. The limited noise also reduces your risk of being detected by those at moderate to far distances. The .22 is also a highly versatile round capable of bringing down virtually any kind of small game, and even deer with a proper shot. It’s for these reasons that the .22 LR is often depended upon as a ‘survival round,’ and it’s also why it would be a good choice in an SHTF scenario. From survival to target shooting to training to small game hunting, the .22 LR is a very versatile round and one to be reckoned with. Next, we’ll talk about the .22 LR round in greater detail. There is an extremely wide variety of .22 LR ammunition available on the market. 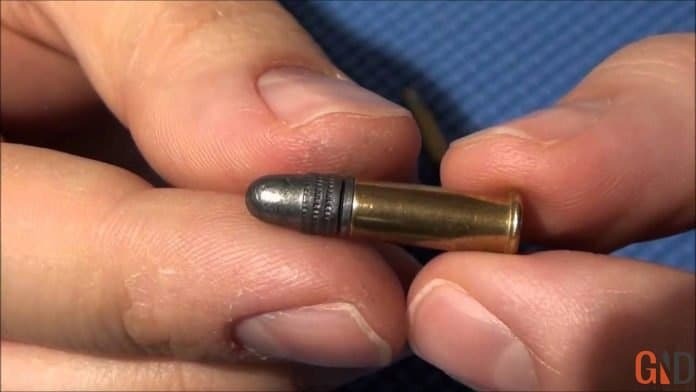 Bullet weight can differ significantly from twenty all the way up to sixty grains, while velocity can be as low as six hundred feet per second up to nearly two thousand feet per second. 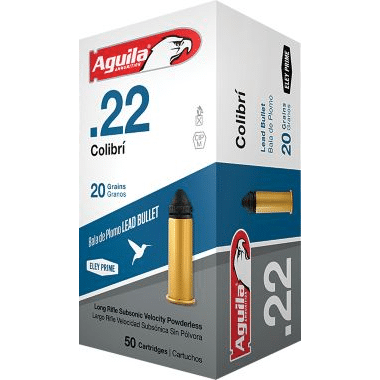 Some .22 ammunition is designed specifically for the purpose of plinking or casual target shooting, and this ammunition is what is commonly sold in the ‘bulk’ backs at discount prices. Other .22 LR loads are designed to be used for hunting or for specific guns. Certain popular .22 pistols, such as the Walther P22 for instance, are designed to function reliably only with high velocity .22 ammunition (or ammunition with more than 1,250 feet per second). However, not all .22 ammunition is created equally, and some rounds are higher quality than others. This is no different than with other calibers. In the next section, we’ll talk about the best brands of .22 LR that you can buy. As a subsonic round, the Aguila Colibri is designed to function reliably at a speed that is less than a speed of energy. As a result, firing this ammunition means you will experience less muzzle energy and velocity. In other words, you’ll be trading less speed and power in exchange for a quieter round with less muzzle flash. Another interesting fact about the Aguila Colibri ammunition is the fact that they do not use powder. Instead, they are reliant on the primer to propel the bullet down the barrel. This is one reason why the Colibri ammo is so quiet. For pest control or target shooting on a homestead where you really don’t want to disturb anyone else, this would be excellent ammunition to go with. Unfortunately, since the bullet relies on the primer to be propeled forward, this ammunition can only be used in pistols and revolvers. It cannot be used in rifles, so if you were hoping to use this ammunition in your Ruger 10/22 or Marlin 60, unfortunately, you’ll be out of luck. The CCI Blazer ammo is commonly sold in bulk packs and is widely available, often times being sold with 5,000 rounds a box and for affordable prices. For casual plinking ammo, the CCI Blazer is definitely the best the market has to offer. Is this the absolute best performing .22 ammo? Not exactly, but it works well enough, and if you’re looking for ammo that you can just shoot all day without breaking your bank, it can’t be beat. The CCI Blazer ammo has a bullet weight of 40 grains with a lead round nose. This has one major pro and one major con: it will expand on impact (which is good should you need to use it for self-defense), but on the other hand it will cause fouling to build up in your firearm, requiring you to clean it more often. 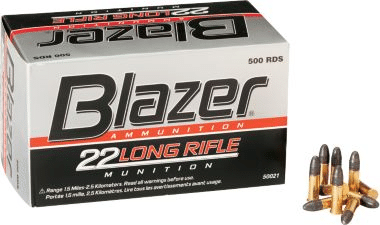 All in all, for an economical .22 round that will be a great choice for casual target shooting and practicing, the CCI Blazer ammo is an excellent and practical option. If you’re looking for .22 ammo that is just a notch above the CCI Blazer ammo, give the Federal AutoMatch target ammo a good look. Yes, you’ll have to pay a slightly higher price for this ammunition, but you’ll get what you pay for since this ammo is designed to function more reliably and accurately out of .22 caliber handguns and rifles alike. How exactly is the Federal AutoMatch an updated version of your typical plinking ammo? The answer is that Federal designed this ammunition to be consistent both in terms of cycling the action of your firearm and in traveling accurately down the barrel of your weapon. While CCI Blazer is excellent bulk-pack ammo, as we discussed, it’s designed to be plinking ammo and not much else (and furthermore can foul up the action of your firearms after repeated use). 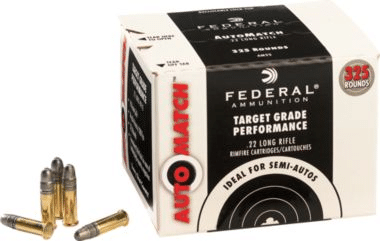 The Federal AutoMatch Target ammo is an upgrade above that. The bullet weight of this ammunition is forty grains with a round nose bullet shape. It is commonly sold in three hundred and twenty five round bulk packs or in fifty or one hundred round cartons. Do you not yet have a .22 in your gun collection? Or do you have a .22 firearm but have not yet realized the true versatility of it? In fact, having both a .22 semi-automatic rifle and a .22 pistol or revolver of some sort in your arsenal would both definitely be wise additions. Since .22 ammo is so economical (and has been becoming more available since the .22 shortage that began in 2013), you may end up shooting your .22s more than any other firearm.